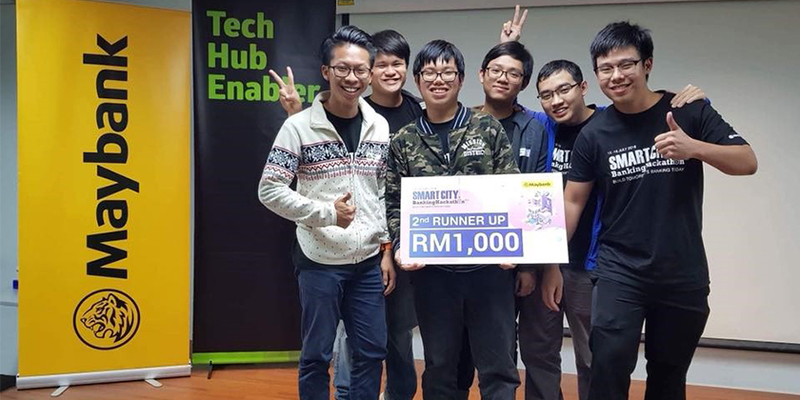 Smart City Banking Hackathon was a three-day competition from 13 to 15 July organised by Maybank and Cyberview Sdn. Bhd. The event aimed to foster progressive and constructive brainstorming among a vibrant and innovative group of people and subsequently come up with proposed solutions to how should banking be in a smart city. A joint-force of our students from Department of Chemical and Environmental Engineering: Ir. Leong Wei Dong, Dr How Bing Shen, Teng Sin Yong, Manson Kho Kaizi; from School of Computer Science: Lo Wei Hong; and another student from Asia Pacific University, Toong Chee Sheng had finished as 2nd Runner Up. This joint-force named as Team BRT had not limited themselves within the boundaries of banking and financial scopes. Instead, they come out with a creative idea which integrates banking with smart energy distribution system. With their invention, the problems including unnecessary electric tariff of users due to a sudden spike of maximum demand, unsecured profit of TNB, environmental impacts (due to over-relying of fossil energy) can be effectively resolved. The preliminary evaluation shows the proposed solution will bring substantial ROI (> 20 %) with a reasonable payback period (~4.5 years). One of the mentors, Mr Pavala M Kannan, the Chief Technology Officer of TNB-IT Sdn. Bhd. was positive on the practicability of this ground-breaking idea. “Bringing real industry challenges and expert from different background together can create more practical and innovative solutions to solve real industrial problems,” said Ir. Leong. “Teaming up with experts from various fields is beneficial as a team share visions, knowledge and skills to yield implementable solutions which are more effective and impactful” Dr How added. “The adrenaline, friendship, and victory made every hardship we went through the three days worth it,” said Lo. “It is most satisfying to see that the financial world actually appreciates engineering works! I hope our solution can bring some benefits to our country’s development,” Teng concluded.